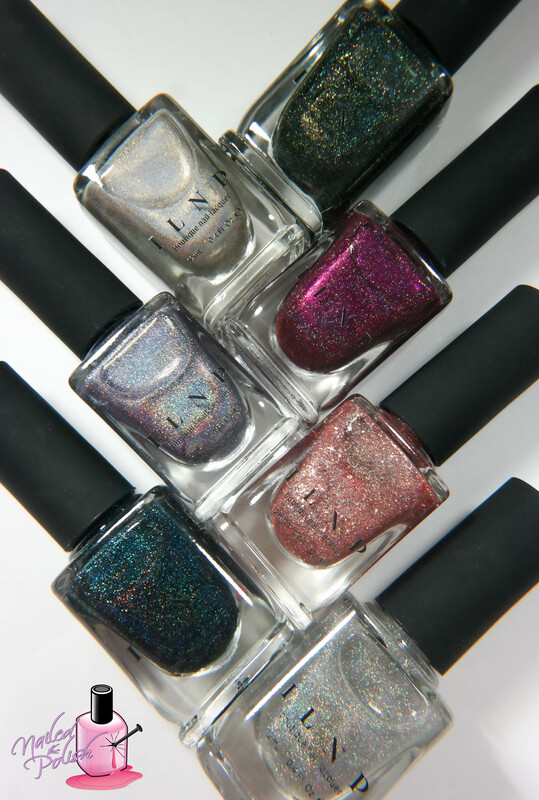 In this post, I’ll be sharing swatches of ILNP’s Winter 2015 Collection. This collection consists of seven absolutely gorgeous polishes. Let’s get this ILNP party started, shall we? First up is Ski Lodge – a deep mossy green holographic with added holo shards, gold shimmer, and gold micro flakes. Shown here is two coats plus top coat. This polish has a fantastic formula with great coverage! I am loving the mossy green tone of this polish. The added gold shimmer gives this polish a woodsy essence that is great for the winter season! Cozy Mittens is a light grey linear holo with added gold flakes. In certain lighting, these gold flakes actually make the polish appear more champagne toned. Shown here is three coats plus top coat. I reached opacity at two coats but added a third just for fun. 😉 The formula of this polish is really easy to control. It also dries fairly quickly and levels very well. The added gold flakes are absolutely wonderful! They are very apparent throughout the polish but not so much that that’s all you see. Such a unique polish! The combination of the light grey holo and gold flakes is magnificent! My Private Rainbow (X) is a beautiful holographic topper. Shown here is ONE coat over black. If you are familiar with ILNP, you’ll know that there are three other variations of My Private Rainbow. 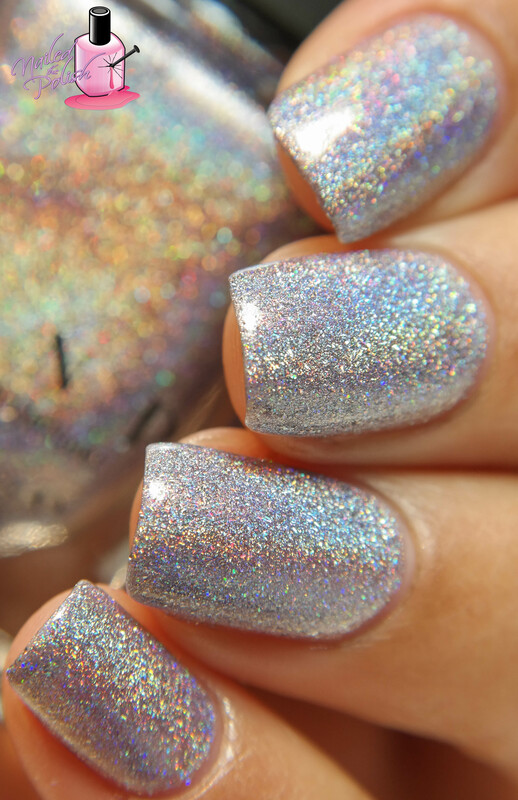 In this polish, the holographic particles are the largest giving you tons of holo sparkle. Think China Glaze Fairy Dust but on steroids! 😛 The consistency is perfect as is the ratio of holo to base. There’s so much fun to be had with this polish! Breathtaking! Astonishing! Sensational! I could go on and on! Showtime is a deep and rich raspberry holo with holo shards and raspberry shimmer. Shown here is two coats plus top coat. Let me tell you – my photos do not do this polish justice. The raspberry shimmer gives off a metallic vibe that is exquisite! Coupled with the vibrant raspberry base and holographic elements, this polish is a jaw dropper and show stopper! The rose gold, the holo, the silver micro flakes – I can’t!! Wow, wow, wow, WOOOWWWWW! I am completely and utterly obsessed with this collection! The formula of every polish is perfection. Even though there are only seven polishes in this collection, there’s nothing that I feel is missing. Words cannot articulate the true beauty of this collection. You’ve gotta see it for yourself! Ski Lodge, Sweater Weather, Showtime, and Juliette (you really, really, REALLY need Juliette) are my personal picks from this collection. The ILNP Winter 2015 Collection will be available for pre-order here starting tomorrow, November 20th at 11am PST ending Tuesday, November 24th at 10pm PST. All polishes featured in this post are priced at $10.00 plus shipping but will be $9.00 during the preorder!